Acquaintance: The process begins with a phone call between you and Mr. Chambers. This discussion clarifies your expectations, purpose for the portrait, attire, location, and any other questions you may have prior in preparation for a sitting. The time and location of the sitting is scheduled, and travel arrangements made. For posthumous portraits, plans are made to collect all photographic references of the subject, including videos, that will help Tim to become familiar with the subject. Sitting Prep: Mr. Chambers and his assistant arrive at your location one to two days prior to the sitting. Upon arrival Mr. Chambers makes acquaintances with the subject (and family if a personal portrait). At this stage, Mr. Chambers is already beginning to ‘paint’ your portrait, taking a plethora of mental notes as he seeks to know his subject. He surveys the location considering the lighting and background for the portrait, whether it be indoors or outdoors. Being that Mr. Chambers is renowned for his sense of color, and particularly for his outdoor portraits, he prefers to work by natural light if at all possible, but has artificial lighting equipment available if needed. Mr. Chambers doesn’t require anything of his subject until the sitting location is prepared; he wants his subjects fresh for the sitting. Next, Mr. Chambers considers the best pose for the subject, taking in mind the subject’s personality as well as any perimeters for the portrait set by the client. Sitting: When Mr. Chambers is satisfied with the pose and setting composition for the portrait, he begins taking his reference photographs for the portrait. The session usually lasts approximately 45-90 minutes. Proofing: Mr. Chambers then reviews the sitting photographs with the client, either on site immediately after the sitting, or if not possible, online via his website. By process of elimination, Mr. Chambers narrows down the poses and facial expressions to a few ideal compositions while noting client preferences, plus anecdotes of the subject’s physical and personal characteristics. When this step is complete, you will have a good idea of what to expect for the portrait’s pose and composition. Mr. Chambers makes sure there are no unpleasant surprises in the portrait process, and covers details such as framing, estimated delivery date, etc. before returning to his studio, armed with ample reference material, notes, and inspiration! Color Study: For larger portraits and/or outdoor portraits, the next day after the photo session, Mr. Chambers conducts a live painting session to capture the intricacies of color and light that cameras are not able to discern as a trained eye can. Mr. Chambers produces either a small painting sketch (a.k.a “color study”) or work on the original canvas to record the splendor and nuances of color (see more about this topic here). This stage takes approximately two hours. At times, additional live sessions are called for. It is an exciting thing to watch, and some clients request an additional live session for the pleasure of seeing Mr. Chambers do his “magic”, and Mr. Chambers is happy to oblige, as he especially enjoys painting outdoors from life. The Painting: Mr. Chambers returns to his studio to complete your portrait. This takes anywhere from 2-12 months, depending on size, easel schedule, etc. Final Proofing: Upon completion, Mr. Chambers sends you digital images of the completed portrait for your review. There’s nothing like the original, but this approach has proven sufficient to provide you an opportunity to request any minor adjustments, which Mr. Chambers will immediately render in his studio while the painting is still fresh on his easel. Oftentimes revisions are unnecessary. However, Mr. Chambers’ desire is your complete satisfaction, and he will ensure you are thrilled with your portrait. You’ll receive updated images of any revisions to approve before delivery of the portrait. 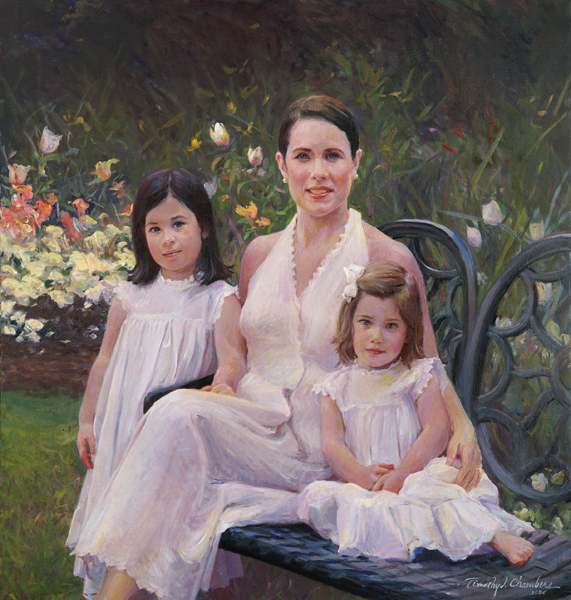 If needed, minor revisions are made on site upon delivery of the portrait to your home or office. After digital approval of the portrait, discussion is made regarding framing; all portraits must be unveiled framed. Mr. Chambers uses only the best quality gold-leaf custom frames. Delivery: Upon approval of the portrait proof, plans are made for delivery of your portrait either in person or via shipment. This can be a private occasion or a reason for celebration with guests. This is a grand event, for even after having previewed the portrait via email, clients consistently say the actual portrait far exceeds their expectations. Mr. Chambers is thrilled to be able to present a gift that brings so much heart-felt pleasure. It is indeed a privilege! If you have any questions or would like to discuss commissioning a portrait, please don’t hesitate to contact us.